One of the most engrossing jazz piano trio albums to come along in the last ten years! Eight of pianist Frank Kimbrough's intriguingly unfolding original compositions — wonderfully melodic and full of regeneration — are captured in a live concert of New York's influential Jazz Composers Collective concert. Because this was a live concert, these tracks are first and only takes and they are astounding (! ), crackling with anticipation, generating excitement with each turn of a phrase. Joining Frank are bassist Ben Allison (Palmetto recording artist, whose most recent recording Peace Pipe ran high on the charts for seven weeks and was named one of the top albums of the year in the Down Beat international critics poll) and drummer Jeff Ballard (dynamic drummer for Chick Corea). 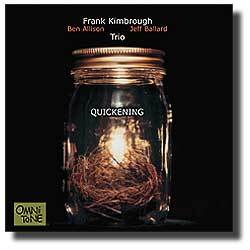 Jazz piano fans, new music fans, good music fans — Quickening may take your breath away! Buy Quickening now at the OmniTone store. All compositions by Frank Kimbrough, Kimbrough Music (BMI). Recorded live 24 September 1998 at The New School University Jazz Performance Space in New York City. Hear Frank with Joe Locke on Verrazano Moon, The Willow, and Saturn's Child, and with Ron Horton on Genius Envy. Click here for a list of Frank's recordings available in the OmniToneStore.